Every girl wants to twirl! 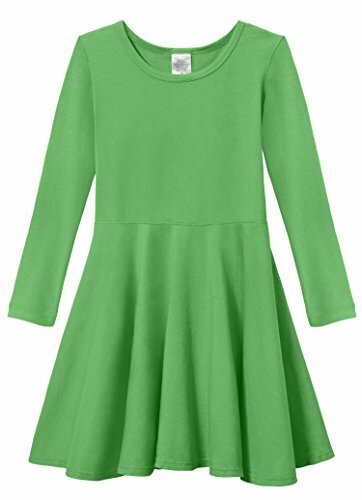 This Twirly Dress is a cute, easy and simple everyday cotton basic. Soft locally knit cotton jersey, made in the USA. Why pay a little more for this dress? Simple, you get what you pay for. They are QUALITY items made with the highest-quality materials, highest-quality stitching, safe, comfortable, and made in the USA. Trust us, your child will LOVE them and they will ask to wear them over and over again. They are perfect for sensitive skins because they contain no harsh chemicals, are made with 100% super-soft cotton, and they have a slight stretch to them. There is no substitute for giving your kids comfortable, safe, and good-quality clothes. It may even save you money because these items will last long and be worn a lot! COMFORTABLE - 100% super-soft cotton perfect for sensitive skins. The celebrity baby boom has inspired modern moms to look for the hottest new trends in baby clothes, and you can't ask for better press than City Threads. When your name has been associated with the tiny tots of celebrities like Ashlee Simpson Wentz, Christina Aguilera, Liev Schrieber, Heidi Klum, Sandra Bullock, etc. the clothes are an easier sell. Add to the celebrity appeal the fact that the apparel is made in the U.S.A., and you've got a goldmine! If you have any questions about this product by City Threads, contact us by completing and submitting the form below. If you are looking for a specif part number, please include it with your message.